I was so excited when I read that one of my favorite celeb couples were engaged after they began dating back in 2004. I was even more excited when I heard they chose my birthday month of January to exchange their vows! 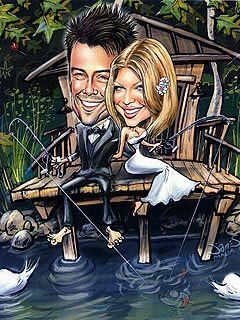 On January 10,2009, Fergie and Josh tied the knot at the Church Estate Vineyard in Malibu. True to her Fergalicious self, Fergie changed into not one but two ultra fab gowns by the ever chic Dolce and Gabbana. She chose super hot Jimmy Choos, a veil studded with diamonds (any bets they were real!? ), and a bouquet of white flowers. There were magnolia trees, lighted tents, 25,000 flowers and a 150 pound cake (which I can only imagine was unbelievably delicious!). The star studded guest list included Justin Timberlake and Jessica Biel (do a see a wedding in their future?! ), Shia LaBeouf, Megan Fox, and the ever adorable Kate Hudson. She followed 10 bridesmaids dressed in black down the isle to her waiting groom who was telling himself to "keep it together, you big baby". Awww, it makes you think for a moment that celebs are real people too! Their wedding planner Mindy Weiss said she knew she could "bling it up for Fergie" and that "nature was important to Josh". Josh told US magazine that their wedding was all about small details that "incorporated both our personalities". Shortly after the wedding, guests received a gift from the uber hot couple. Fergie and Josh had an amazing invitation made by Lehr and Black that featured their caricatures. What I love about their choice is how it reflected their personalities. Fergie loves unicorns and bling while Josh loves nature. When I saw the photo, I immediately remembered the HP commercial Fergie does where she talks about deep sea fishing with her dad and the caricature was of the couple fishing off a dock. Cute! Congrats to Fergie and Josh! I hope to see some of my future brides incorporate details that reflect their personalities as a couple and as individuals. After all, the details are my favorite part of the wedding planning process and I love photographing them too. Oh and the cakes are pretty great too! I loved their wedding photos in US mag. They are such a stylish couple and seem so in love. You really can have some nice details as a bride without spending a fortune and I bet you could have a similar wedding to Fergies without spending millions. Then again, I am no planner. Thanks for sharing Ginger! Oh I think Fergie is great and I loved Josh in that robot movie! What a cute couple. That invitation is such a neat idea too.